Here’s Looking at You, Erie Reader, Erie, PA. Review of Foto Booth, Group Exhibition through Eyewash Projects at 319W2, curated by Larry Walczak. 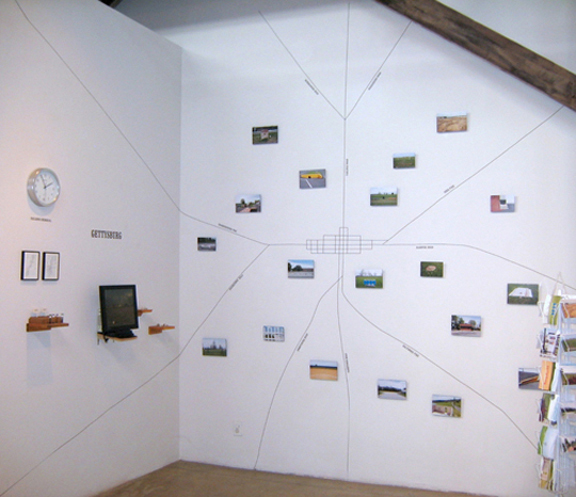 In the quirky but intimate space of 319W2 (a garden shed in the backyard of Larry Walczak’s abode at 319 W. 2nd St.), the latest from his Eyewash Projects is FOTO BOOTH, an exhibit asking photographers for a “selfie” that focuses “on the psychological states of mind that transcend the surface of literal photo representation.” The result is 20 eight-by-eight inch works clustered in three groups by 20 artists, from both New York and Erie. Inherent in a self-portrait or even a casual selfie, is a revealing of some inner self along with the physical exterior. And most of the artists here graciously took the risk to give us bigger windows into their cerebral ecospheres. Others played it a little too safe. The few disappointing works were straightforward and simple — sometimes a good thing — but they came across here as “typical” selfies, just more artfully arranged. They offered little but a superficial look at the artist, suggesting glamor shots from a fashion magazine rather than psychological introspection. The rest, though, are deeper looks, sometimes fragmented or conceptual, which pull the viewer in for a closer examination. Phil Beuhler harks back to his early days as a photographer with a tonally washed-out shot of himself squinting behind his first camera, and Bryan Hiott offers a similarly obscured image, as if he were a ghost caught in mid-emergence from the wall behind him. Local artists Carol Posch Comstock and Greg Zbach deliver digitally altered pieces writhing with color, and both Kris Risto and Destiny Dombrowski offer their faces in organic finery. Risto’s face materializes up from a green field with yellow flowers, and Dombrowski’s subdued roses frame her face, suggesting the lushness of her mind, or the beauty found there. On the other hand Michael Tkach’s straight-on unadorned approach is amusing and disturbing at the same time, something we’ve come to expect from Tkach. Working within the confining space of eight-by-eight inches can be challenging, but it also offers the possibility for creating a detailed work that might be too difficult to achieve on a larger scale. Patricia Fabricant and Jessica Sutton pull off wonderful collages that splinter their faces, creating motion and texture. Fabricant weaves paper in a checkerboard pattern that displaces her features just enough to set things ajitter, while Sutton juxtaposes slices of different photo techniques in diagonal sections that intimate conflicting depths. The selfie’s place on social media makes it feel disposable, just another flash of celebrity in our visually hyperactive world. In fact, studies claim that one million selfies are taken each day, while others suggest a whopping 93 million, on average, per day. But as early as the fifteenth century, artists in the western world were making self-portraits, so the concept is not as new as it seems, except now everyone can do it. The art world has noticed this development and is starting to mine the possibilities of this new form of portraiture. If you couldn’t make it to the Saatchi Gallery in London for its big “Selfie to Self-Expression” show earlier this year, swing on by FOTO BOOTH in what I lovingly refer to as the Art Shack. Here you can nibble on the arc of human emotions all while standing in one spot. 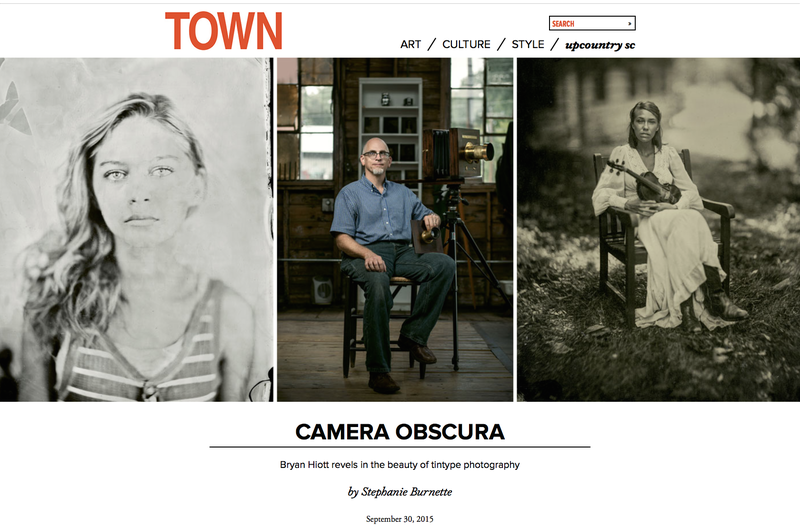 A feature article by Stephanie Burnette in the October 2015 edition of TOWN discusses my tintype photography and my latest series of abstract archival digital prints of the fractal patterns and chemical traces in the process. This is a video segment for the Taylors Mill Artists exhibition at Hamption III Gallery. The exhibition showcases the work of selected professional artists working in studios at Taylors Mill (formerly The Old Southern Bleachery). Exhibition dates: July 3rd to August 16th 2014. The Opening reception will be Thursday, July 3rd (6-9 p.m.), 3110 Wade Hampton Boulevard, Taylors, SC 29687. The image above is a still from my recent appearance on Carolina Now with host Jamarcus Gaston. I’m discussing my portrait work with the 19th century wet plate collodion process and my studio at Taylors Mill. South’s Greatest Desinations, South Magazine, March 2014. This travel destination piece on Greenville, South Carolina mentions my studio at Taylors Mill and features one of my recent tintypes of the Reedy River downtown. 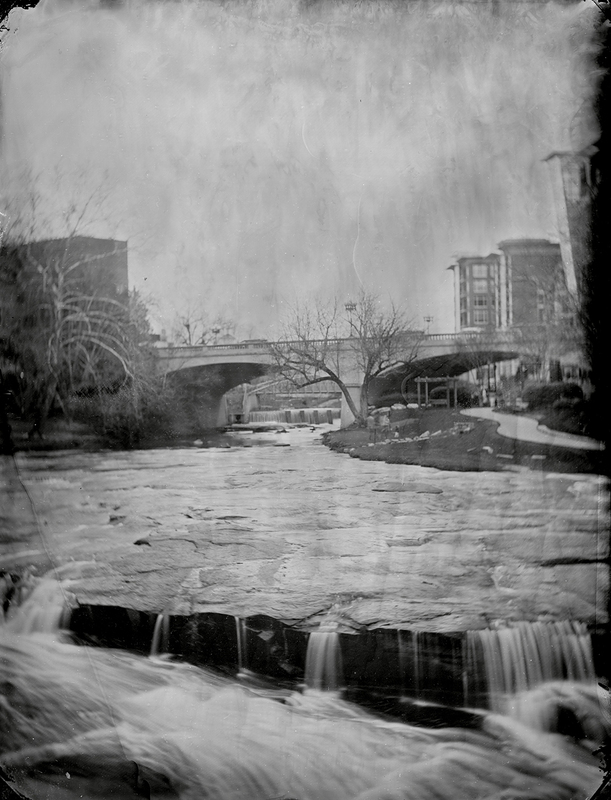 Reedy River, Greenville, SC (2013) Tintype photograph by Bryan Hiott. 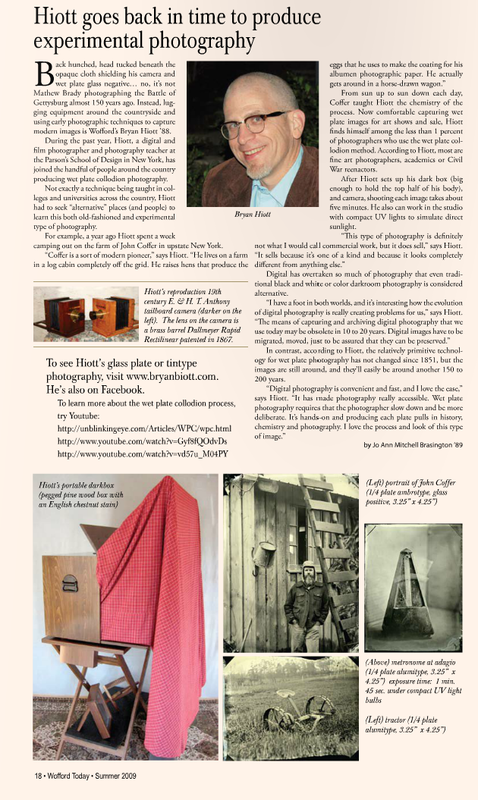 “Hiott goes back in time to produce experimental photography,” by Joann Mitchell Brasington, Wofford Today (Summer 2009). This feature article in the Wofford College alumni journal discusses my photographic work with the 19th century wet plate collodion process. For the full text, visit Wofford Today online and turn to page 18. “ATHICA exhibit takes a look at our ‘in between spaces,” Athens Banner-Herald, Athens, GA (May 10, 2007). This article discusses the group exhibition “Ruburbs and Other Spaces In Between: Land Use and Environmentalism” at The Athens Center for Contemporary Art (ATHICA). The exhibition was curated by Quinn Gorman and Sage Rogers. ” For the full text of the article, visit the Athens Banner-Herald Online. In the installation “Gettysburg,” Bryan Hiott, an artist from New York City, has created a portable tourist kiosk of the town, but rather than featuring historic landmarks, the images in his photographs, video and “Historical Amnesia” line of original postcards are of street curbs, a FedEx drop-off box, balding patches of grass and pale expanses of dirt and concrete. His work shows the collision of past and present: in one of his videos, re-enactors fire their muskets in Civil War dress as traffic whizzes by the large hotel in the background. “Photos Reflect Changing Southern Landscape,” by Tanya Bordeaus-Hamm, Spartanburg Herald-Journal (May 13, 2001). This feature article discusses my solo exhibition of color landscape photographs in the Sandor Teszler Gallery of Wofford College. For the full text of the article, visit the Spartanburg-Herald Journal Online.